That is why Fee, offers a working definition of Spirituality that is altogether characterized in terms of the Spirit of God. “One is spiritual to the degree that one lives and walks by the Spirit; in Scripture the word has no other meaning and no other measurement”. After laying the goal and essence of approaching Scripture, Fee, then moves to exegesis, as he writes that the Scriptures can only be properly interpreted on its own terms, which consequently leading us to the exegetical task itself. These two (exegetical method and spirituality*) are seen as constantly at war with one another, with the result that the piety in the church is – for good reason – highly suspicious of the scholar or the seminar-trained pastor, who seems forever to be telling people that the text does not mean what it seems plainly to say. The result is a reaction to good methods as such, since such a way of looking at the text seems to run at cross-purposes with a more devotional reading of the Bible, where “the Word for the day” is received by one’s direct encounter with the text in a more free-floating, associative way of reading texts. The bottom line is that such people take their own brand of “common sense” approach to the Bible: read it in a straightforward manner and apply it as you can; and “spiritualize” (sometimes = allegorize) the rest. Fee, explains that: when we speak of intentionality, we understand that to include the form/style/genre upon which the biblical writer proposes to communicate. It is in keeping these things in mind that he now moves towards the intersection of exegesis and spirituality that is seeing it within the framework that: faithful biblical exegesis always takes into account the Spiritual purposes for which the biblical documents were written, which then leads towards a genuine engagement that comes out of empathy wherein we see ourselves become passionate lovers of Christ, as we now see Scripture in terms that are not simply our own, because we have taken into account the text’s historical, cultural, geographical and grammatical milieu. As a fitting conclusion to his essay Fee, then brings us back again to the beginning, which completes the circle that is completion so far as exegesis and Spirituality is concerned takes place only when we rise up and follow, when we who would be “spiritual” would recognize that true spirituality is not simply inward devotion but worship that evidences itself in obedience and the same kind of God-likeness that we have seen in Christ himself, for exegesis without spirituality is empty, spirituality without exegesis is blind. It is only when we find the synthesis between historical inquiry and Divine Revelation that we complete the circle that binds exegesis with biblical Spirituality. 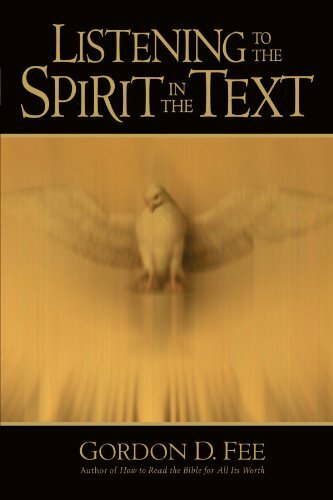 This entry was posted in Biblical Studies, Summary and tagged Biblical Studies, Exegesis, Gordon Fee, Hermeneutics, Spirituality by Chuck Baclagon. Bookmark the permalink.